A leader in the American civil rights movement Martin Luther King had a dream (listen to I Have a Dream Speech) of racial equality. 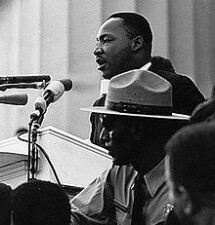 King was murdered on April 4, 1968 (watch CBS news report) . Lauren Lawrence Private Dreams of Public People reports that a few months before his death, King disclosed having a dream one night; ‘I had died and noone was there. I yelled at Ralph (Abernathy), "Ralph, bring those people standing there over here".' We can sense the political loneliness ("noone was there") that came with King's leadership. We can also sense King's desire for the realization of his dream. King's last speech tells us that much as Moses he may not see or get to the promised land (watch video of last speech) however the civil rights movement towards racial equality must continue.